These days, more and more companies need high-quality, reliable and efficient server hardware. Home labs used by enthusiasts and professionals in the IT sphere for software developing and testing, studying for an IT certification, and configuring virtual environments became popular as well. Small companies are also interested in cheap and compact servers, the production of which is based on a couple of virtual machines or networking applications. Supermicro company ranks one of the leading positions in server development for a long time. Supermicro products range from the Hi-End clusters to microservers. 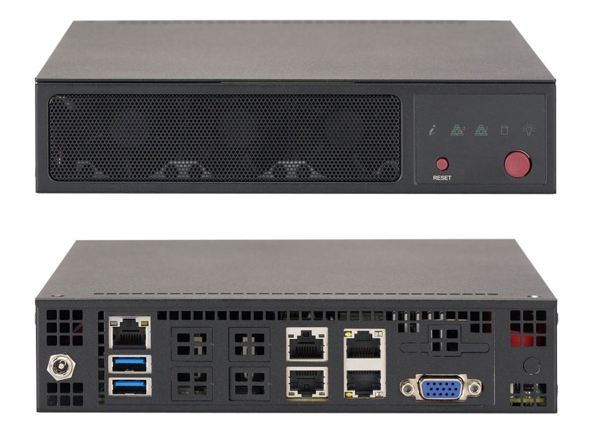 Recently the company released two compact servers: SuperServer E200-8D and its younger model – SuperServer E300-8D. Having pretty decent characteristics and taking up minimal space to be deployed, as well as being energy saving, these servers will fit perfectly for educational purposes, virtualization and run minor networking and firewall applications, security appliances etc. So what makes them so attractive to home lab owners? Let’s tear these little guys apart and see what’s hiding behind the chassis. Both servers are based on Intel Xeon D-1500 family processors, launched in Q4 2015. Pretty good choice for the home labs because of increased number of cores. E300 uses Xeon D-1518 with 4 cores, 2.2 GHz each. E200, being a top of the line model in the series, runs on Xeon D-1528 processor having a bit lower clock speed comparing to 1518. However, it has 6 cores able to run in TurboSpeed mode. In the result, core frequency can be increased up to 2,5GHz. In my opinion, one of the most important things in setting up a home lab. It is quite clear that every new technology, be it the new operating system or an application, needs an increased amount of memory to be assigned to it. Especially if we’re talking about virtualization stuff. The common setup composed of a cluster, a minimum amount of test virtual machines, Domain Controller etc. will eat up your memory quite fast. Thus, you will need to free up some of the resources by deleting previously configured environments. Both SYS-E300-8D and SYS-E200-8D servers have an option to increase the amount of RAM up to 128GB per server. 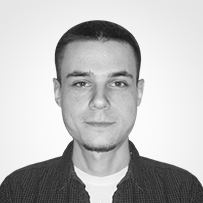 This ability allows you to use even a single server with nested configurations without being afraid of running out of compute resources. Supermicro servers use DDR4 RAM, which now became cheaper than the DDR3, thus allowing you to maximize the characteristics of your environment for the same amount of money. Our Mini-1U servers provide space for a single 2.5 and 1x M.2 drive onboard. I’d personally prefer one more slot for an HDD, so I can play with RAIDs and build a shared storage between the servers on top of HDDs in RAID. However, the good thing is that Supermicro uses PCI-E 3.0 x4 M.2 interface in its boxes, thus allowing you to use much faster NVMe drives. You can create a tiered storage within SYS-E200-8D server, as well as assign an SSD cache in your virtual environment. Unfortunately, SYS-E300-8D can’t provide that, so you can only choose between 2.5 and M.2 drives. Here comes the most delicious part of the servers.  Network ports number and bandwidth is a very important parameter when setting up a home lab. In those cases, when you are playing around with clusters, simulating failovers and testing the performance of the different solutions, you need a higher throughput between your servers. Using a couple of 1GbE ports will not be the best option in this case. Supermicro has gone far and equipped their Mini-1U SuperServers with a pair of 10GbE ports in addition to the existing pair of 1GbE ports. The lower-spec E300-8D even has a few more 1GbE’s totally equaling to 6 ports. Using the high-bandwidth networks will provide you much more options in case of using all-flash configuration as well as an NVMe drive. You will be able to separate your management traffic from the synchronization achieving the maximum performance of your cluster. The number of ports also comes in handy with the NIC failure tests. Both Supermicro servers utilize Aspeed AST2400 graphical adapter and support IPMI 2.0 for the host management and monitoring. Also, there is additional software such as SuperDoctor and Watch Dog for monitoring and support KVM-over-LAN. E200, as well as E300, has two USB 3.0 ports. The lower-spec model has an additional PCIe slot. Building a home lab often requires minimum space and power consumption. Supermicro Mini-1U servers are compact and use 40-60W, which is a good value in comparison with some full-sized nodes. The noise level is also quite low – chassis is equipped with 2x/3x 40mm fans, and thus you can place them at home. The servers are cheap, so you can buy a single E200-8D starting from $800, and the maxed-out server will cost you near $1500. 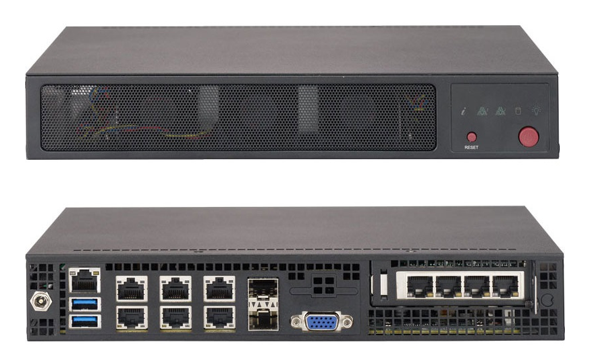 Both Supermicro SYS-E200-8D and SYS-E300-8D are good servers, which can be used for building a home lab as well as managing network security and firewall applications, domain controllers etc. Intel Xeon D-1500 series processors, the ability to increase the amount of RAM up to 128GB per server and the presence of 10GbE network ports make these servers perfect for setting up various virtualized environments, nested configurations and performing any kind of tests you want. The size of chassis, power consumption, and cheap prices also make them attractive and worth purchasing.